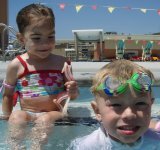 Small Group swim lessons offer students the opportunity to interact with one other student of a similar age and ability while still receiving personal attention from their instructor. This small group setting allows for your student to get more one on one time with their instructor while socializing with another student. Instructors are all certified as Water Safety Instructors by the American Red Cross. Children are enrolled in classes based on their age range. Children must be able to understand and follow instructions without parent participation. Games associated with swim skills may be incorporate in to the lesson in order to help with the learning process. Classes range from students with no swimming ability to students learning freestyle, elementary backstroke, breaststroke, sidestoke and backstroke. *Session 1a & 1b are for Evening Lessons only. All other sessions will have both Morning and Evening times. In an effort to provide you with a quality program we request that you please register your children the Wednesday before Session starts. A $10 late fee will be added to your order if we are able to add you to the Session after the Wednesday before each Session. Please see the registration deadline below.